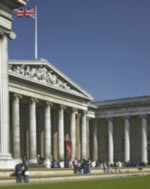 The British Museum was founded in 1753 with the gift of the Sir Hans Sloane's collection. The founding collection already included Japanese material acquired from the family of the German physician Engelbert Kaempfer, who acquired them when he worked for the Dutch East India Company in Nagasaki from 1690 to 1692. The Japanese collections of the British Museum currently number nearly 30,000 objects from the archipelago dating from prehistory to the present. The collections comprise archaeological material, the arts of Buddhism and Shinto, paintings and woodblock prints, swords and armour, metalwork, lacquer, pottery and porcelain and sculptural and carved works (including netsuke), basket work and textiles, in addition to works from the Ainu and Ryukyu island cultures. The collection of around 4,500 Japanese paintings includes many fine pieces from the Kamakura period and later. The collection of some 7,000 Ukiyoe prints and paintings features works by all the important artists. Archaeological material includes about 350 objects from the Kofun period, while the collection of swords contains a number of blades of exceptionally high quality. The 4,000 ceramic works are almost equally divided between porcelain and stoneware. The ethnographic collection comprises some 1,500 pieces. The Museum's purpose-built Japanese Galleries first opened in 1990. From October 2006 they will feature a new display 鐃緒申Japan from Prehistory to the Present'.